World, meet the Tensor of the Vastus Intermedius! Hot from the desk of Cool New Things: in a pre-published article submitted to the journal Clinical Anatomy (2016), a group of researchers in Switzerland have determined they have identified a new muscle in the thigh! This muscle becomes part of the quadriceps groups, beginning in the upper-outer part of the thigh and travelling to the knee. A bit like when you learned Pluto was no longer a member of the planets, anatomy very rarely produces entirely new structures, or redefines known parts of the body. Variations are often noted, but identifying a new muscle is unique. So let’s outline what is known about this new muscle. Grob et al. (2016) depicts a similar image to the one at right. You can see the three deep aspects of the quadriceps as we previously understood them with the new TVI muscle included (muscle belly is superior to the others’). For reference, this would be a left leg. WHAT DID WE THINK BEFORE? > The quadriceps make up the muscles covering the front of your thigh. > VL, VI, and VM each begin at the upper part of the femur, and travel down the front of the thigh to the patella — your kneecap — where they attach as one big tendon — the quadriceps tendon (image at right). > The RF begins higher up, attaching to part of the pelvis before travelling on top of the other three muscles until it also reaches the patella as part of the quadriceps tendon. > The new muscle is called the Tensor of the Vastus Intermedius (TVI). > The TVI begins at the upper, outer part of the femur, between the VL and VI origins. > The muscle itself is actually quite short, but it continues down the leg as a thin aponeurosis (basically a tendon) until it also becomes part of the quadriceps tendon and attaches to the patella (specifically the inside, or medial, aspect of the patella). See #1 in the first image at the top of the page for the TVI path. HOW COULD EVERYONE MISS THIS? This part of the leg is a rare area for surgical intervention, so it is unlikely many surgeons have needed to study this area in GREAT GREAT detail. DOES EVERYBODY HAVE THIS MUSCLE? > Yes — sort of. > While there are references to similar muscle structures in older anatomical studies, and the TVI muscle was found in every specimen (26 legs) examined by this group, the variation between people noted above means your TVI might not be exactly the same as my TVI. In fact, the authors note that the TVI in my right leg could very well be slightly different than the TVI in my left leg! Independent type (42%) where the muscle belly and its tendon (aponeurosis) is unique to itself at all times (no blending with other muscles). VI-Type (23%) where the TVI tendon shares an aponeurosis with the VI. VL-Type (19%) where the TVI tendon shares an aponeurosis with the VL. Common type (15%) where the aponeurosis between the VL, VI, and TVI is indistinguishable — they all share a common one. Two muscle bellies (19%) where the muscle belly is made up of two or more smaller pieces of muscle instead of one single muscle. HOW CAN YOU BE SURE IT ISN’T JUST A VARIATION OF THE OTHER QUADRICEPS MUSCLES? Consistent Origin: Regardless of how the tendon travels, every specimen studied by this group had an identified TVI muscle belly. 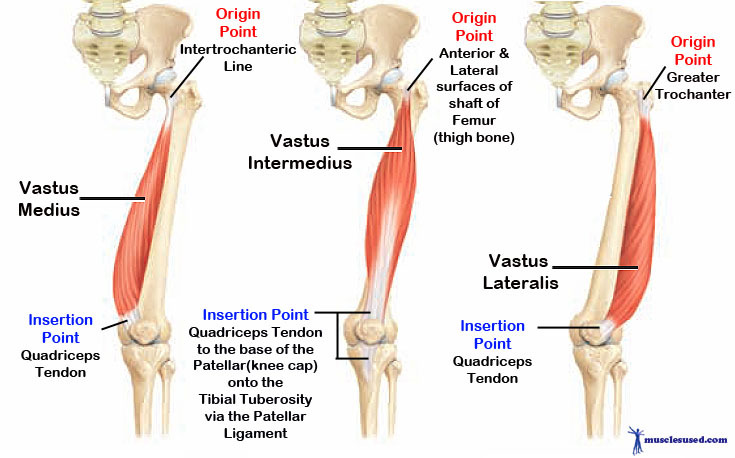 Consistent Insertion: Every specimen also had a unique presence in the middle layer of the patellar tendon (where it attaches to the kneecap) — so even with the five variations noted earlier as the TVI passes down the leg, it is always clearly distinguished at the beginning (closer to the hip) and the end (closer to the knee). Distinct Nerves and Blood Vessels: The TVI is innervated by independent branches of the femoral nerve and is vascularized through unique branches of the lateral circumflex femoral artery. A unique and consistent pattern of nerves and blood vessels should only be present in individual structures. OK I’M CONVINCED — WHAT PURPOSE WOULD IT SERVE? As the TVI aponeurosis is often fused or closely related to the VI muscle, it may exert tension on this muscle — contributing to the VI function as well. Hence the name: “tensor of the vastus intermedius”. Grob K, Ackland T, Kuster MS, Manestar M, Filgueira L. A newly discovered muscle: The tensor of the vastus intermedius. Clin Anat. 2016;Pre-Press, available on-line http://www.ncbi.nlm.nih.gov/pubmed/26732825. Photo Credit Athikhun.suw via Wikimedia Commons — no changes — per CC License. This entry was posted in Blog and tagged anatomy, Muscle, Quadriceps, Science, Tensor of the Vastus Intermedius. Bookmark the permalink. ← The Rotator Cuff – What is it? Now that this is public knowledge. What is the treatment application/implication ?? Thank you for the finding! As the authors noted, given the diagonal insertion to the patella it is probable that this muscle contributes to patellar control, and/or provides tension to the vastus intermedius during general quadriceps function. As for treatment and real-world implications though… I think we need to wait for more specific research to know for sure! I propose that [one of] the function(s) of TVI is in the support of correct, functional foreword bends. In that, when bending forward to pick something up, or when getting up out of a chair, the legs must bend at the knees to protect the vulnerability of the lower back. To enable the legs to bend with minimum muscular effort, the feet are softly lengthened and broadened; the legs are simultaneously lengthened, backs of knees to both backs of heels and buttock bones, and from the groins down the inner planes of the legs to the inner ankles. In lengthening the feet from the heels to the balls of the feet and broadening across the balls of the feet, a subtle neuromuscular response spirals through the legs, which may be felt in the inner knee to outer thigh*. This inner knee to outer thigh activation impacts upon the deeper muscles in and around the buttocks, pelvis and lower back, keeping them soft, open and supportive of the activity; rather than being clenched, immobilising the lower back; or inactive, causing collapse in the lumbar curve.